The PVM-1741A is an all-in-one OLED picture monitor, delivering unparalleled picture quality with the performance features and functions found in more expensive monitors, all contained in a compact, stylish design.PVM-1741A flexible mount options make the 16.5-inch monitor ideal for desktop editing, office viewing, studio monitor walls and OB vans. The colour shift depending on the viewing angle has reduced to less than half compared to a conventional OLED panel. It allows several people to evaluate the image with extreme accuracy at the same time, increasing the monitor’s versatility in top end monitoring solutions. The Super Top Emission OLED display panel benefits from TRIMASTER EL™ technology. It offers superb black performance, wide colour gamut and quick response with virtually no motion blur. By combining the Sony OLED display panel (Full HD, 10-bit driver) and Sony’s OLED processing technologies, the PVM-1741A OLED monitor delivers ground-breaking picture quality. The PVM-1741A accepts various computer signals input up to 1920 x 1080 through its HDMI connector. This product also comes with PrimeSupport – fast, hassle-free repairs and a helpline offering expert technical advice which gives you the peace of mind. The PVM-1741A Super Top Emission OLED display panel features full HD resolution (1920 x 1080) and RBG 10-bit driver to create life-like and smoother-than-ever gradation from dark to bright portions of a scene. The PVM-1741A provides the colour gamut specifications of the main broadcast standards: ITU-R BT.709, EBU and SMPTE-C. 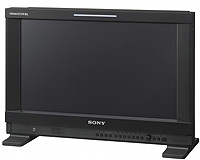 The PVM-1741A monitor incorporates an OLED processor to bring out the full performance of the Sony OLED panels. This OLED processor offers superb uniformity across the whole screen. At the factory, the OLED panel uniformity is precisely measured and corrected using a sophisticated RGB LUT (Look-Up Table) adjustment system. The PVM-1741A incorporates a lightweight, compact metal body. It supports VESA mounting of 100 mm pitch and an EIA 19-inch standard rack mount. Although the monitor has its own display stand, an optional stand SU-561 is available for height and tilt picture adjustment. These features make the monitor ideal for use in a variety of applications, such as desktop editing, office viewing, studio monitor walls, or installing in an OB van. The combination of the vector scope and waveform monitor functions allows simple measurement without additional measurement equipment. The input signal’s waveform with a 2-channel audio level meter can be displayed on screen. Scaling dataare available for quick measurement. The waveform can display field or line status. A zoom function is available between 0 and 20 IRE so that black level can be adjusted more precisely. The Vector Scope has scaling data for 75% and 100%. Zoom function is also available for the low levels. The PVM-1741A is equipped with built-in standard input interfaces: 2 x 3G/HD/SD-SDI; 1 x HDMI input; 1 x analogue composite. When an SDI interface is connected, the embedded audio channelsup to 16 can be displayed on screen with an 8-channel audio level meter. The PVM-1741A has an external remote control capability for input/output signal selection and adjustment of various items via Ethernet (10BASE-T/100BASETX) connection. Up to 32 monitors and up to four control units can be connected via Ethernet connection and controlled remotely on the network. The PVM-1741A also supports some (though not all) of the functions of the BKM-16R – an optional remote control unit for BVM-E/BVM-L/PVM-L Series monitors – such as power on/off switch and Input Select function.